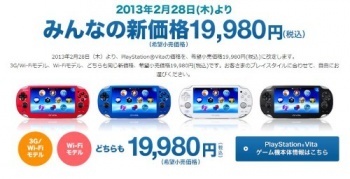 Vita sales have continued to improve following a region-specific hardware price drop. After a year of struggling and repeatedly slashed sales predictions, the PlayStation Vita is finally picking up steam--at least in Japan. Sony announced a Japan-exclusive price drop on the handheld hardware last month, and the effect was immediate: Vita sales in the region quadrupled. As of last week, the Vita hasn't lost its post-price drop momentum; Sony's handheld sold 63,581 units, putting it ahead of the Nintendo 3DS. Vita sales were probably helped by last week's Japanese release of Tales of Hearts R, which followed Senran Kagura: Shinovi Versus and Phantasy Star Online 2 the week of the price drop. Considering the Vita sold less than 12,000 units the week before Sony slashed its price, the new sales numbers must be encouraging for Sony, though the publisher hasn't announced a price cut for any other region. A worldwide price cut for a system that's still relatively new wouldn't be unheard of; Nintendo cut the 3DS launch price after just a few months due to slow sales, which yielded positive results. Sony did the same with its $500 and $600 PS3 launch models, and seven years later PS3 sales have been healthy. The Vita is a great piece of hardware, so it's nice to see it doing better, even if it is only in Japan; perhaps this will encourage Sony to drop the handheld's price universally.